Blueprint America — with NOW on PBS — in a report with correspondent Miles O’Brien looks at the massive amount of freight moved throughout the country — mainly by trucks on an aging highway infrastructure that’s crumbling and bursting at the seams. With projected population growth and a rebounding economy, experts say it is only going to get worse. So as Congress begins a major rewrite of the nation’s transportation laws, many are asking if it is time to redirect freight traffic off congested highways onto more environmentally friendly and fuel efficient railroads. Sounds good, but there is a catch. Unlike highways that receive public funding, railroads are private. Should taxpayers sink public money into a private railway system? And where should the money come from? 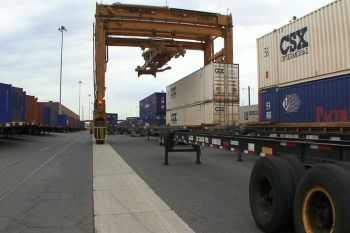 Though the competition for investment dollars is heating up, the two systems depend heavily on each other — a train hitched with 250 trailers needs 250 trucks to move that freight to its final destination. To try and figure out who should pay the freight, O’Brien travels to a trucking school in Central New Jersey, where he learns to back up a big rig, to Bayonne, New Jersey, where massive amounts of consumer products come to port every day, and to Washington, DC, where transportation policies are under debate.